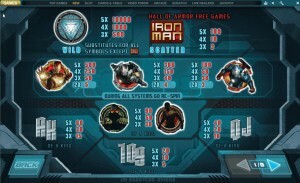 Iron Man 3 is the third slot machine that Playtech releases which is based on this topic. They’re all games created with the official blessing of Marvel Comics, being themed around the character with the same name, Iron Man, which has his own comic book in their collection. There were also multiple movies that were created with Iron Man at the center of the action, so it shouldn’t be a surprise that it got multiple slots as well. Keep reading to learn more, there is plenty to figure out about its features. This is a game with 25 lines, with re-spins, free spins of three types, scatter symbols and wilds. The top prize the game offers is either at $100,000, or it’s a progressive jackpot which comes from Marvel. 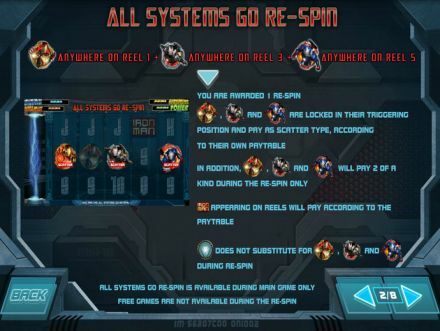 I’ve loved the experiences that the free games features give you in Iron Man 3, with the three types of spins which can be triggered being all very exciting. There are also wild symbols and scatters in the base game, but the truly exciting part is when the free games are in use. To use the wild symbol, it’s enough to get it to appear in a position on the reels of the game, and to have a couple of other regular icons together with it. If the wild and the other symbols manage to create a combo of three or more, a reward will be offered. It’s a lot better if the wild does this together with other wilds, as they offer their own prizes in that case, and it can go up to 10,000x. The only symbol which the wild can’t replace is the scattered Logo. 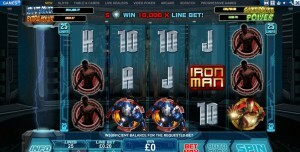 The Iron Man Logo pays as little as 3 times the bet, or as much as 100 times, and to get them you need between three and five such symbols scattered around. Luckily, they’re scatter symbols, so it’s not going to matter what their exact position is. The three types of Iron Man symbols which the game has can trigger their own feature, this Re-Spin. You need Iron Man on the 1st reel, the Black Iron Man on the 3rd reel and the Blue Iron Man on the 5th. If all three symbols are where they’re needed, a single re-spin is awarded, with the three staying where they landed initially and paying as scatters would. The wilds can’t replace Iron Man symbols during this re-spin. If you happen to get a minimum of three Iron Man Logo scatters, you will gain access to the Hall of Armor. You have three types of free spins to trigger here, each one with its own advantages. Mark 42 is going to give you 10 spins for free, with wilds that freeze in place for the next three rounds. If you get the Mark 42 Armor on the 3rd reel, then an extra 3 spins are offered. War Machine triggers 8 free spins, during which you get three randomly placed wilds. Get the War Machine logo on the 3rd reel, and you receive 3 more spins. Iron Patriot is the last mode, which has 15 free spins and a dynamic multiplier, which can be between 2x and 5x to start with. It goes up by 1x each time you get the Iron Patriot on one of four reels (1, 2, 4 and 5), but it can’t go past the 5x mark. 3 extra spins are won when this symbol appears on the 3rd reel. The betting options use 25 coins, and since the game has 25 lines, it naturally needs one coin for each of them. The coin denomination is worth between $0.01 and $10, with the resulting maximum bet being $250. Get the wild to arrange five symbols of this type on a payline, and a 10,000 coins payout will be yours. The value of this prize reaches a maximum of $100,000. A randomly offered progressive jackpot is also possible. Four of them are offered by Marvel, and they’re called Power, Extra Power, Super Power and Ultimate Power, in the order of the value. It’s not a bad design if you look only at the themed parts, but that’s not what is offered inside. There are also poker cards which look like they were made out of brushed steel, and they appear often enough that they seem to dominate the game. The themed symbols are the really interesting ones, showing you three types of Iron Man armor suits. Like you would expect from a Marvel Comics licensed game, the quality is there. Unfortunately, so are the playing cards. 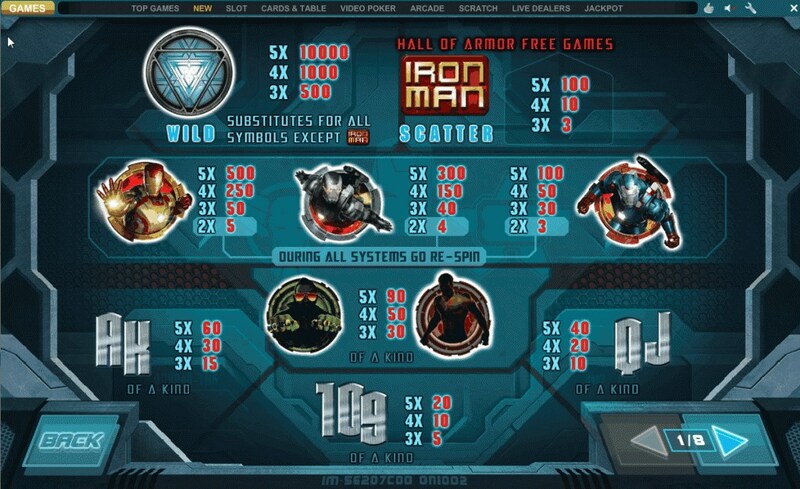 Symbols: WILD Logo (10,000 coins, wild), Iron Man Logo (100x bet, scatter), Mark 42 Suit (500 coins), War Machine (300 coins), American Patriot (100 coins), Green Man (90 coins), Red Man (90 coins), Ace (60 coins), King (60 coins), Queen (40 coins), Jack (40 coins), 10 (20 coins) and 9 (20 coins). It’s a very cool game, and if you played other Iron Man slots, or if you enjoyed the movies or the comic books, then you should try out this slot as well. This being a game dedicated to Iron Man 3, it will be based on the third movie with this title, which was released in 2013. It follows the adventures of Iron Man once again, the main character being played by Robert Downey Jr. Other actors in it were Don Cheadle, Gwyneth Paltrow and quite a few other big names were also on that list. It grossed more than $2 billion in theaters worldwide. 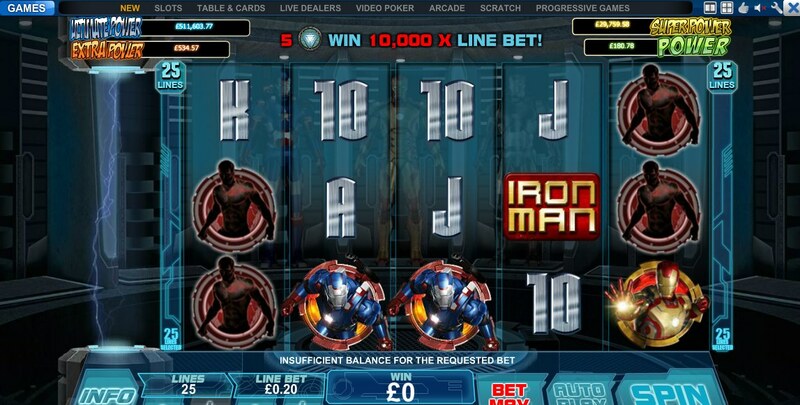 The Iron Man 3 slot machine is offered through the Playtech platform, so if you want to play it for real or just to practice, look out for casinos that use it.